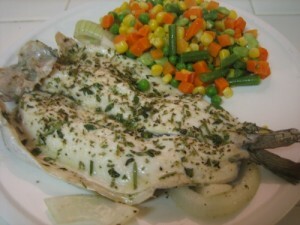 Have you ever wondered how to cook trout? Here is an easy recipe that is sure to please the whole family. Preheat your oven to 400 degrees. Put your fillets on some aluminum foil. Then add the garlic salt and paprika for flavoring. Put some jalapeno pepper on top and sprinkle it with juice squeezed from the lemon slices. Then put the lemons on top of the fillets. Wrap the fillets up in the foil and then bake for about 20 minutes. You will have a wonderful meal if you add something like cole slaw or potato salad with it. That is how to cook trout.